ColecoVision.dk Homebrew Section Presents: John Dondzila. John Dondzila is one of the pioneers in video game programming. Not only for Vectrex, Philips but specially for our ColecoVision. John Dondzila is a service manager for an amusement game manufacturer near the Jersey shore. John have been into video games pretty much since they first came out, however over the past few years he haven't been spending as much time on the hobby end as he used to. John once collected arcade machines,but he don't collect them anymore. He had once a basement full of them. One arcade machine has john, however, saved namely: KLAX, one of his favorite arcade games of all time. John have also written software for two commercial arcade machines and he is currently working on software for two more. Even back in Dondzila's youthful days he enjoyed programming computers. While he spent many hours in Radio Shack playing with their TRS-80's, the first computer which I owned was a Commodore VIC-20. 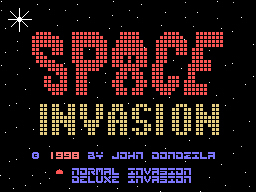 John wrote many games and a small California company picked up 3 of his games and marketed them in a package called SPACE PAK. While John had a 2 year royalty contract, he only saw money for about 6 months but it was pretty good money and kept him in Scotch and Scones for awhile. John later published a type in program for the VIC-20 called COLORBOT. This was featured in COMPUTE! magazine as seen in the above pictures. John was not sure what became of the others. The New Space Pak by: John Dondzila. This is an 8 in 1 cartridge containing all "space" theme ColecoVision games. (Space Fury, Cosmic Avenger, Gorf, Gyruss, Moonsweeper, Nova Blast, Threshold, Star Wars). This is a "sprite" experience in this little game without sound. Purple Dinosaur Massacre was Dondzila's first ColecoVision project. This is more or less a 2 player playable demo. Dondzila wasn't too crazy about how it looked and decided not to continue. The main objective with this game was to get some sprite programming experience. This will work on the emulator, however there is some keystroke. You have to use to seperate the Player 1 and 2 controller input so both sights won't work off the player 1 controls. The object of the game is to shoot as many Purple Dinos as possible before running out of ammo. Shoot the POW for extra ammo. The skill level increases every 10 dinos that you hit. There's no sound in the game- not that Dondzila can't do sound programming, he just didn't feel like continuing this game. So the game was never finished and have either no end. There is some modified roms made with I.C.V.G.M. like Kill Barney in Tokyo and Killer Instinct. First newer ColecoVision game in the year 1998. A demo of this game was released in june 1998. The complete vesion contains 2 graphics set. Space Invasion was based on the greatest shooter of all time, and is a fine Coleco port, which includes both the original as well as deluxe version. Dondzila points out that the secrets are included. 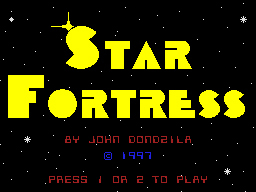 This game is based on the early 80's style space shooter game Star Castle. You or a second player will attempt to penetrate the shields of a heavily armored space ship. You can manuever your ship around the fortress and shoot at the 3 revolving energy shields. As you weaken pieces of the shields, these pieces will break off. Once having cleared a path to the center, you can attempt to land a shot at the mother ship and destroy it. But watch out ! Also revolving around the shields are energy balls which will break loose and try to enter your ship. You can attempt to out manuever the energy balls or shoot them down. Once you break through the inner shields, the mother ship will fire huge energy balls which you can only outrun, but not destroy. When you destroy the mother ship, a new level will begin and increase in skill difficulty. To get in touch with Dondzila, try this: e-mail.